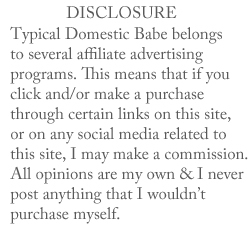 Typical Domestic Babe: My First Post!! I live in Miami, FL the land of beautiful beaches, bodies, and smoke & mirrors lifestyles. I'm a wife-in-training, engaged to the man of my dreams and planning our soon to be destination wedding in Italy. I am the proud mama to an energized Maltese/Shihtzu "Ace". I have a passion for cooking/baking, and take pride in the fact that I'm a really good cook! I'm as domestic as they come, and even though I do have help I truly enjoy doing daily household chores. I have a shoe fetish (what girl doesn't?) and my favorite designers are YSL and Christian Louboutin. I love makeup and all things beauty related. I also love shopping, and live for a good sale!! I'm into fitness, health, and living a clean lifestyle. I'm girly, kind, down to earth, and a little bit dorky. I know how fortunate I am to be living this lifestyle, and I truly appreciate everything that I have! Now back to the typical domestic babe....My view of a typical domestic babe is a strong woman who not only takes care of her household and family, but takes care of herself as well. Its the woman next door who in between neverending laundry piles, lunch dates, and grocery shopping still finds time to squeeze in the gym, pilates, yoga, etc, all while looking absolutely fabulous. In this blog I want to share with you a glimpse into my domestic babe life; what I'm wearing & where I got it, recipes that I love, daily household tips, DIY projects, fitness, and product reviews. Please bear with me until I get the hang of blogging - I'm a newbie! I'm pretty open, so feel free to ask me almost anything. :) I am Pinterest obsessed, and you can follow me there as well by clicking here. I'm really excited about my blog; hope you enjoy it and can't wait to hear back from you!